The problem with most hand held flashlights is they take up valuable hand space. It might be just me, but I find it useful to use both of my hands while I am working on projects. This can sometimes be a hard thing to do in the dark while trying to prop up a flashlight. 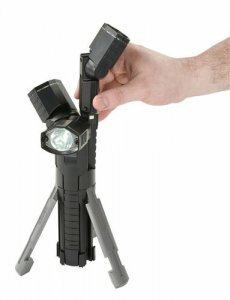 There is, and its called the Stanley 95-155 3-in-1 Tripod LED Flashlight. From a distance it looks like a normal flashlight, but up close you can see that it also has a built in tripod. Now you can light up your work area hands free. If that is not enough for you, it has a total of 3 lights built into one, with each head able to swivel 120 degrees. Press the release button, and your single flashlight with 3 heads, separates into 3 individual flashlights. Now you can work on 3 projects at once. I tried to find a video of it in action, but youtube has let me down.